Aging in place: It’s what 90 percent of seniors say they want for themselves, according to AARP. But even after we’ve retrofitted our homes, do we really want robot “companions” and sensor-powered systems that inform friends or family when we haven’t opened the refrigerator for two days? Isolation might not be a good trade-off for independence — apart from anything else, research shows clearly that it can kill us. What’s the option if you’re not the retirement community type or can’t afford longterm care? This is the first in a series of articles exploring innovative alternatives to aging in place. To see all upcoming articles in this series, sign up for our weekly email. Thérèse Clerc was in her mid-60s when she started to think about how women could grow into old age without losing autonomy. An energetic, passionate feminist living in Paris, she knew that her generation of French women had not been able to build up retirement funds to cover at-home care, because they had spent years caring for families. 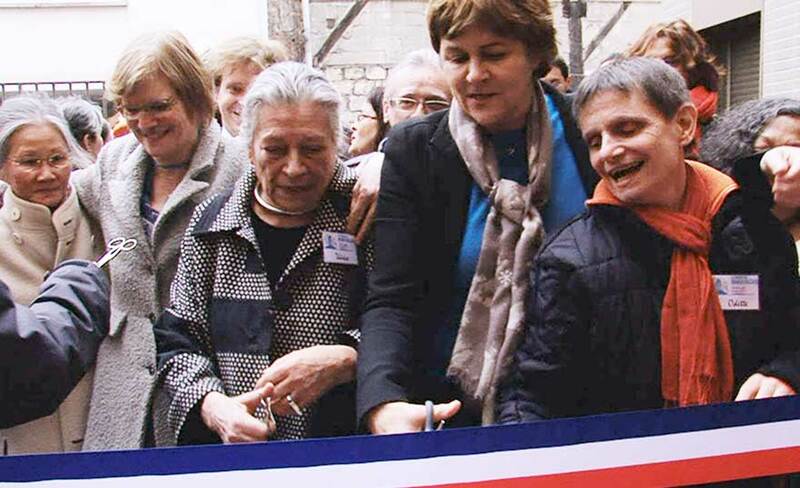 Older women in France, as elsewhere, are among the poorest segment of the population. And Clerc didn’t like what she saw when she visited state-run homes, where life was dull and regimented. Clerc knew that living by someone else’s rules or on their schedule was not in her future. A lifelong activist, she also was interested in demonstrating that old age can be a beautiful time of life. So Clerc got together with some activist friends and came up with the idea to create an exclusively female, self-governing, environmentally friendly cohousing collective for women who want to live independently into old age — yet within a supportive and fully engaged community. They would call it the Babayagas’ House after a supernatural being in Slavic folkore — a witch who offers guidance to younger women. Other groups have followed suit in France and Canada, developing their own models based on the Parisians’, but with some key differences. A brand new apartment building, Babayagas’ House opened in the Paris suburb of Montreuil, France in October 2012, 13 years after the women first hatched their plan. Many of those years were spent securing government funding for the project. The Babayagas’ pitch: The government would save money in the long run by investing in the construction, since the residents would not have to rely on state-run homes down the road. Nor would the government have to staff the Babayagas’ House with care workers. Eventually, the government agreed: Eight state agencies contributed to the four million Euros required to build the Babayagas’ House. As of late last year, the Babayagas’ six-story apartment building accommodated 21 women ages 66 through 89. Seven of the 21 residents are living on the poverty line. Most residents occupy small one-bedroom apartments; some share with roommates. Together, they live, eat and care for one another in the housing project, with no cooks, nurses or other professional staff. Each woman agrees to perform 10 hours of chores per week. The residents plan to pool resources for a doctor or nurse to visit monthly, and one small room that’s currently set aside for guests could serve as accommodation for medical staff if needed. The Babayaga model is an urban one. In Paris, the house is close to shops and the metro. Being centrally located is important for the women’s ease in coming and going, and for encouraging the greater community to come in and participate in what the Babayagas have to offer — and their offerings are significant. A key feature of the Babayaga model is its 860 square ft. ground floor space that’s dedicated as an open university that anyone from the surrounding community can attend. In this intergenerational center, the Babayagas run courses, offer discussion groups, do creative writing and give concerts. One of the tenets of the Babayaga model is that the residents will be actively engaged with the world politically, socially and culturally. “Staying intelligent will keep us healthy…. I believe women who are happy, not bored, will live healthier lives,” Clerc says. 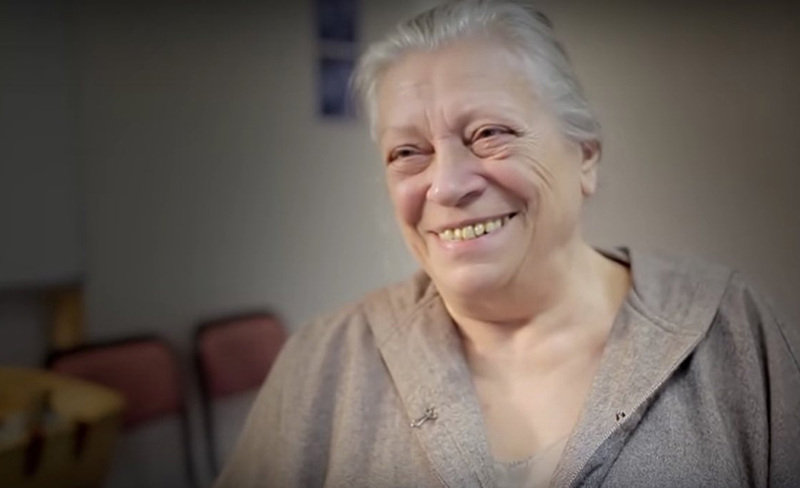 With Clerc’s guidance, other groups of seniors have started Babayaga projects in French cities, and after Canada’s CBC radio broadcast a couple of programs in 2013 about the original Babayagas’ House, seniors across Canada, enthralled, started to think about creating their own version. In Toronto, the interest list for Baba Yaga Place has attracted more than 150 members, and the group is applying for a feasibility study to be funded in part by the Canadian government. Baba Yaga Place has set 50 as the minimum age for residents, and accessibility for people with restricted mobility is high on the women’s list. So is an intergenerational focus. Like their Parisian counterparts, the Toronto Baba Yagas see intergenerational exchange as a core part of their model: ” We have lots to offer to our working neighbors, who may benefit from an experienced cook, dog walker, someone to sign for their parcels, or a babysitter,” Iris Kairow, the 60-year-old founding member of Toronto’s Baba Yaga Place, told Senior Planet by email. “The socio-political aspect of Baba Yaga means we stay active and involved in the broader community, not isolated,” Kairow notes. How will idea become reality in Toronto? For reasons of budget and expedience, the group is considering populating an existing apartment building, which would be run as a nonprofit coop, rather than building a new one. Several multipurpose common spaces would be created and each member would participate in decision-making, as well as sharing tasks. What happens when residents need care? Residents would care for one another, and the Baba Yaga community would make sure to provide additional care when needed. Currently, Kairow sees nursing care as being secured and paid for by individual members; it would be interesting to see the communal model expand, so that as the community ages and more members need specialized care, they could hire providers as a group and dedicate living space in the house for them. What does it take to create and live in a community based on the Babayaga model? We took a look at the Babayagas’ House in Paris. 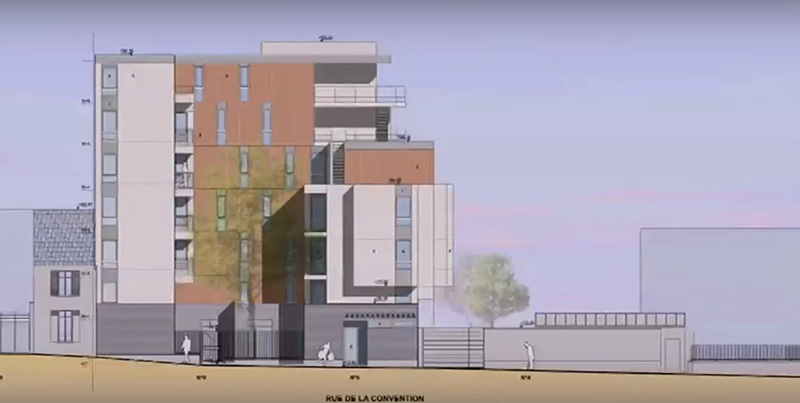 The French government subsidized the construction, and residents pay an average of 420 euros or $460 for a 375-square-foot apartment. Monthly visits by a healthcare professional are paid for communally, and the group has a plan and accommodation in place in case live-in care is needed. The Babayagas purposefully built their house near public transportation and everyday resources like shops, which makes it easier for residents to stay independent and active. From community-building to funding and setting up self-governing structures, making a Babayaga-style cohousing project happen takes extraordinary amounts of time and energy. But if the pioneers do a good job of documenting the benefits and savings, and the model spreads, there’s a good chance that local governments elsewhere may start to support similar projects. Babayaga is a creative alternative for people who want to live independently, have the camaraderie and support of housemates, make their own rules and engage with the local community. It’s not for everyone. I’m in New York, 63 y.old, and I love the idea! I would like receive the updates on this topic. Formerly a musician/instructor, worked a s a Natural Health Cooking Instructor, specializing in diets for health and healing. The power of the group is a life enhancing power. I hope that a Baby Yaga organization can be started in New York City, Manhattan. The project sounds just wonderful and it is sorely needed for seniors who like me, live on monthly fixed incomes. luckily, for the time being, I am 77 and have been living on my own with exception of a cat for some 54 years, 52 in the apartment I live in now. Your concept sounds right up my alley and I would be interested in connecting with other seniors who are of like mind in NYC area. Hoping that this can become a reality, please sign me up. Hi, Bonjour or Hola- I am an older woman who had to leave my home of over 40 yrs. With my limited income I had to sublet a ROOM . I must leave the room by Sept. 16th. I live in a college town so housing is expensive. Since I’ve lived in Davis, Ca. for 43 yrs. and am familiar with the town I really want to stay here. I would move to a close town but I’ve found nothing available in my price range. The subsidized senior housing has waiting lists of up to 5 years. Some of the rooms for rent are over $900 per month. I am currently pretty panicky!!! I also have cats and not every place takes animals. The Baba Yaga sounds WONDERFUL!!!! Too bad there’s nothing like that around these parts!!!!! If anyone from near this area (Davis, Calif.) reads this, please let me know if you have any ideas. I am also very interested in this living model. What are the next steps? I’m currently looking for someone to have a room for rent. I’m very interested in this concept it’s what I need for me and I have always been a giver to anyone that I can help. my husband of over 32 years passed away in 2013. We never had a home we always had to rent it has been so hard for me to get anywhere because I have never driven a car at all. I have had 2 back surgeries and 2 neck surgeries plus medical issues I have been able to manage with meds and eating healthy. I’m having to live with my sister and I have no say so in anything but pay over half the bills when I only get one check a month and her and her husband both get paid over $1000 a week and my one month income is not that much at all. I’m 56 and disabled and I want a plan where I can feel wanted and needed. I live in North Georgia and I would love to know if there is a place like this near me. I would relocate to anywhere I would just have to get another Dr very quickly and I will need transportation to get there and get a way to Dr and pharmacy plus get food. I have been closed off in a bedroom for 3 years now. I need my angel to help me. I’m Christian and love god but my prayers haven’t been answered yet but I will never give up on God or my faith. I don’t like to ask for help but this last year I have searched for it with each tip and dream God has sent to me. I’m alone and need help and support from anyone. God bless everyone of you and thank you for taking the time to read reply. My story is a long and sad one. I love this idea but it seems most of the people commenting are “healthy” aging people who are very active. How does this work for people who have mobility issues, maybe bed ridden and need care, etc? These doesn’t seem to be much discussion about this. Living communally is wonderful if it works for those involved. Are the healthier ones really willing and wanting to help the sicker ones, would help be coming in, etc? I live in Scotland, in a little town outside Glasgow called Milngavie. I live near (5 minutes walk) to the Town Centre which is home to local shops, doctors, dentists, pubs and community centre. I live on my own, but I’m 56 and already I am feeling lonely even though I have lovely neighbours. I would like to live in a Babayagas type co-housing with other women in my local area. I have already identified a piece of land which we could build co-housing development for say 20 women. However the land will be at least £1 million to buy and that doesn’t include getting resources like water, sewage and fuel into this land. I believe co-housing would ensure that we would be more healthy as we would be socialising with other like minded peers. It would free us from relying heavily on social services for care in the community and GP services as well as hospital services. I am not saying we may at some time not need them but I think people who live in a co-housing situation live longer healthier lives as they will not be living alone. I believe i need to action now in order to get this moving and I really do not want to wait until I am in my 80s before i start thinking about senior living situation. I am hoping the council and the Scottish Government can help me. Derdriu, I have just discovered senior planet and was so interested to read your post. I’m Scottish (from Glasgow), 64 and have been living and working in Andalucia, Spain for the past 10 years. I’m separated, live alone in a rented flat and often feel isolated. For many years I’ve been following the tiny house movement, in particular, projects in the US where small communities of tiny houses have been established, some for women only, and it looks like such a wonderful way of life, where people who are on their own can feel a sense of belonging. It’s my dream to live like this in Scotland, or even Spain, but it seems the cost of land is enormous and there are planning restrictions because tiny houses are, well, tiny inside, therefore not regarded as fit to live in. The idea of co-housing such as the Babayagas model is an exciting alternative and one which I hadn’t thought about before. I would be most interested to hear how your plans are progressing and if you have had any feedback from the Scottish Government about help they could offer. Many thanks! I am in BC Canada and have been talking about this concept for years and although I’ve met people who think (yeah that’s a nice idea) few believed that the idea was workable. I KNOW it can be done and would love to find out if there is such a community in progress in BC. I live in a subsidized (HUD) senior building in a suburb of Chicago, owned by a faith based organization. We pay 30% of our adjusted gross income in rent, but after medical insurance and other medical costs, not much is left for anything else at the end of the month. Each small apartment has a bedroom, living/dining room, kitchen, bath and several closets. This is called an “independent living” apartment building, meaning there are no services offered. We do have a large open community area on the first floor with a large TV and several tables, chairs, sofas, etc. The perimeter of this room houses the laundry room, a tiny library, a computer room with ancient computers and slow, to non-existent internet, and a large dining area for activities or other gatherings organized by the residents. Compared to other HUD buildings, this is a very nice building. But there is very very little resident interaction with the community, or with each other. It would be wonderful if we had one of the dozens of universities in Chicago and the suburbs offer low-cost or free classes here, but no such luck. ( Years ago they did) Intellectual, social, and cultural stimulation here is non-existent. In suburban Chicago, there is little public transportation. The bus schedule is extremely limited. Few residents own a car, and those who do, can barely afford it. We have no grocery store within walking distance, (and many of us have difficulty walking ) so those who don’t drive must pay $10 roundtrip for a cab to the closest grocery store. I still own a car and I will take anyone to the store, but that will only last until my car drops dead. If we had reliable, frequent bus service, many residents here would be able to get out and about. But now they are isolated, depressed and therefore, often prematurely die. Furthermore, healthcare and medication costs in this country are outrageous. Medicare pays so little, but if one cannot afford a supplemental insurance policy to cover the costs that Medicare doesn’t pay, the bills rapidly mount and then access to healthcare becomes nearly impossible, unless in the ER. My cost for Medicare Part B is $109/month (increasing to ? in 2018), the required Medicare Rx plan (part D) is 64.50, increasing to 75.50 in Jan 2018, and my supplemental insurance plan C is now 163/month, which increases every 6 months. So each month I pay nearly $350 for health insurance. My medication costs are additional. So I’m glad I found this senior HUD building, although I had to wait 7 years to get in. How do other seniors who don’t live in subsidized housing make it? Many of the residents here are women, but not all. Many lost all of their savings paying for their deceased spouse’s medical bills. Many women had no pensions. There are a million reasons why seniors end up in a HUD building. Many of us are college educated, with active minds and disabled bodies. We need more subsidized buildings in the US, but we need all the other things I mentioned in order to live a life worth living. We question whether this is a life worth living. If not for the medical costs and access to good healthcare outside of the US, I’d be out of here in a heartbeat. I live in Colorado and love it. However, the high altitude here in the Rocky Mountains is beginning to affect my health. The lack of oxygen has never bothered me until now. I am seventyish and have been told by doctor to move to sea level. Hence, I am investigating Aging in Place and The Golden Girls Network in Maryland. Both are great ideas. Please contact me if you are interested. Years ago, I lived in Brooklyn NY and then Manhattan before my husband and I moved to Indiana. Now I am divorced and write books. I have lived by myself by many years and love to hike. I’d love to learn more about this. I just turned 62, am working from home and I’m a script reader for several film and screenplay festivals throughout the year, but I would love to move back to Northern California, and share a home with women who worked and were creatively driven as well. I’m an aging Psychologist in Sonoma County. We are constantly ” looking at” senior housing, affordable housing, and housing shortages. The wildfires didn’t help. But seriously, the only advocates will be us, given the cuts to SS and Medicare. I love this area and will not be driven out. I adore the Babayaga idea. No more caring for men and children. However, interacting is cool. Hi. I am 61 and people say I am the nicest persons ( woman) you wiill ever meet! wow, an honor. I love this idea for women to live together and Miss Sonoma,, I too do NOT ever want to leave this California area which is I think God’s creatiiion and I don’t believe in God. I hope that does not offend you, but I am undecided. I liie in Los Gatos, ca and just love it here and also in Sonoma. I do hope you will ask me questions and see if I may be someone who would click with you and your group! I love people and am gentle, and will try to help my friends all the time. It makes me feel so good to help. My 3 boys are super succesful and I MISS THEM SO MUCH. Time for me to begin looking into a new plan. I am 71, presently living at a Cohousing Community in Amherst Mass. I wish to move to N Cal and continue living in community, with affordable rent. I wish to band together with others Babayaga style, and could invest some money into a cooperatively purchased and operated property. My vocation is textile design, botanical print making, yoga. Thank you for corresponding. I’m also 62, live in the Chicago area, and am constantly thinking about where (and how) I want to live next. The idea of co-housing has been on my mind for many year, but I haven’t found anyone I know who is interested. I love the idea of living in northern California with women who are Get in touch with me if you’d like to talk more. i live in n.y. and we need babyaga here – need more info. Hi, I’m on Vancouver Island and am interested in the project. We have a large population of elders in our community. I would be especially interested in in housing specifically for older lesbians. Try this for more in English about the original Babayaga in Montreuil. Heading for Paris and plan to explore! Ellen Count, Please report back on your visit to the BabaYaga House in Paris. I had hoped to visit while I was there this Fall but that didn’t happen, so I’d love to visit next trip (hopefully within a year). Please let me/us know if anyone there speaks English, since my many attempts to learn more than the basic polite phrases in French have not been successful. Thank you in advance for any info you can provide! Sure, I’ll report – but are you interested in the Montreuil BabaYaga as a model or as a place to possibly live yourself? If you followed the link I posted for more info in English, was that helpful?…. Ellen, Thank you so much for your info. I’m just interested in knowing your/someone’s impression of the Paris BabaYaga House. Since I’m not French I wouldn’t be eligible to live in the Paris one but just want to find out what it’s like. Thanks for any info you want to share about your visit. This has been my idea for the last 5 years! Why? Because I am originally from Rome, Italy. I lived almost 20 years in San Francisco, California. In 2006 I moved to Southern France, where I lived for 4 years and then I moved back to Rome where I stayed for more then 4 years. In 2014 I came back to the US and since April 2015 I live in Southern Florida. Meanwhile, many of my girlfriends got divorced or lost their husbands. But, because of my hectic travel, they are all over the world! However, we all feel lonely and we wish could be living close to each other. I believe that here in Florida would be the perfect place! However, I do not know how to start this project….any feedbacks? i too live in Florida and pray for help like this. I pray daily, but retiring at early 60’s is not my idea, but helps me, need to stay active though and don’t, knees hurt, osteo has me in hurt, fake knee, but keep falling and can’t walk good, still have friends, but nobody comes to house and I have no Church, need both again, just to feel someone is here. Need a project like this, any feedback from you? Thank you too. I am very sorry to learn that Thérèse Clerc has died. What a great lady and an inspiring example, pursuing an exceptional idea in her advanced years. This is an excellent project. The Abbeyfield model has a fee dent housekeeper who cooks lunch and dinner for the ten independent residents. In Australia the government used to fund them if a local group found suitable land. Housing in Australia is exhorbitatively priced and many young and older people, mainly older women cannot afford to rent it buy. So with thousands living in poverty in one of the richest countries in the world, is inhuman. Not too many older women have the stamina to do what There’s Clerc did. I admire her enormously for her achievement. My imagination has been fired up, and my creative, organizational juices are flowing, after reading about the Babayaga Way. Working in affordable housing at this time, in a senior community, gives me some idea of the requirements and challenges of making affordable housing for seniors work, especially in this part of the world where high rents and the high cost of living makes finding affordable, safe and healthy homes nearly impossible. And since I am now 60 years old myself, this would be a perfect time to explore creating a Baba Yaga House in Northern California. Also, coming from a lifetime of activism and commitment to feminism, I love the whole idea behind what Baba Yaga means. Is it possible to get contact information for Iris Kairow, founder of Toronto’s Baba Yaga Place? Thank you so much for this article and the important ideas and information that it conveys. Hi Denise, Iris Kairow has given us permission to share her email with seniors who are interested in exploring this model: iriskairow@gmail.com. Keep us posted! Thank you so much! I will keep you posted, most definitely. 7/20/16 – I will be in Paris for several months this Fall and would love to visit the Babayaga House but have not yet found an address for it (other than it’s in the eastern banlieue of Montreuil). Could you provide an address or email where I contact them about a visit by this 71-year-old U.S. female? Thank you in advance. This seems similar in broad concept to Abbeyfield House… They are in UK with some in Canada. We need that here in New York. Affordable housing for seniors needs to be addressed. If one was started here in New You you could count me in. It’s just what I need. I like the idea very much, but I would have to know what size apartment or space I would have for my stuff so I can purge. I would love to take this further, please get in touch with me at 718 639-2095. I was just reading about cohousing for seniors pulling the resources together and living creatively, in a positive social situation. What have you discovered since you first got involved with this idea? I And brand new to this site as of today…. I live in central Arkansas and Would love to explore this concept. I am helping to take care of my 92 year old mother, who is in “assisted-living”… right now , and at some point, after she is gone I would want to figure my life out again…. My focus is on her right now,… and she will probably live to be 100 just like her mom. I would love to explore this concept with others that would be interested in having healthy positive living and being able to pool resources together. Thank you for this! I’m in the early stages of building a much smaller version of this same thing, and I’ve found it remarkably difficult to convey the concept — as soon as people hear any of the “geezer” words, they lock into the institutional concept, with passive seniors tended by paid staff, or the “cohousing” concept, which is kind of like a suburb only smaller. This will make it SO much easier to discuss what I’m doing! And the name is a nice bonus — I’ve always wished I could live in Baba Yaga’s magical house. Westomoon, good luck with your project – keep us posted! My housemates and I have been inspired by the Baba Yaga initiative in all of its iterations. We are four retired women who live in a small quaint town in Ontario Canada and we will be moving into a shared home ownership house on October 31, 2016. We have designed the house together and will live in it under a tenants in common ownership arrangement, in a single dwelling configuration…common living areas, kitchen etc. We do not have cooking facilities in our spacious suites. So we have a $million dollar+ home, two blocks from downtown and the waterfront of our town and we are the talk of the township. We are especially well known because we fought zoning bylaws…and won…when the town tried to declare our shared home idea as a new kind of dwelling and then decided that this new kind of dwelling they defined could not be built anywhere in our township. So we are all pretty excited about our new venture and would be pleased to share more information about what we have done and what we have learned. While I was wrestling with the city about building my “geezer villa” from scratch, I stumbled upon an existing ranch house with a lot of bedrooms and bathrooms. It was laid out in such a way that it was only minor changes away from the design my “focus group” of friends had come up with — private 2-room “apartments” per person, each with some private outdoor space and an external entrance of its own, plus a common guest room & bath, two good-sized common living rooms, and a kitchen big enough to share comfortably. It also has a few acres of land, which makes it easy for a mobility-impaired person to have a dog — and grow vegetables — and plenty of parking. So I bought it! I fenced the yard for my dogs, and right now, I’m sort of camping out in this enormous house while I do some severe downsizing at my previous house so I can sell it. This winter, I hope to start the remodeling to turn this big-family house into a shared house for geezers. I’m taking a “Field of Dreams” approach — I will build it, and hope for the best. At this time of life, nothing is certain, so I’m just going for it. The fine points can be sorted out later. love this idea. Build it and they will come ! Im interested in seeing how this works out for you too. God Bless ! Wonderful! Where IS this dwelling? Downers Grove Illinois–Immanuel Residences. We are just west of downtown Downers Grove, 1/2 block west of the library. The Metra station for trains to the Chicago loop is 1 block east. And IL offers discounted Ride Free passes for trains and buses. Westomoon, I’d love an update on your project! I’ve just found this site and I’m very inspired by the concept. I’m in the mid-Atlantic US and looking for just this sort of living situation. This sounds like a great idea; I’d like to see the concept open up to include married couples living together as well.